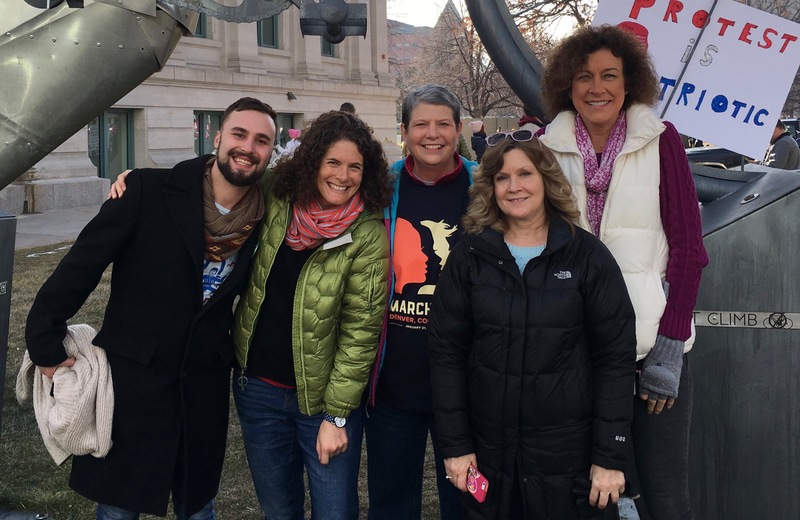 On January 21 I joined four friends and walked the couple of miles to the start of the Women’s March in Denver. Our conversation was light, but our resolve was strong. We walked with purpose and joined the march a hundred yards behind it’s leaders. Estimates put the crowd somewhere between 125,000 and 175,000. Though I came of age during the demonstrations of the Vietnam War, this was my first march. Back then I sat comfortably in my white, male, entitled, draft-exempt world wondering what all the fuss was about. Though it was decades later, I did the same thing with the Million Man March. Dear God, forgive me. I know many Christians were unhappy right to life groups were excluded from sponsoring the march. What made the event so effective was that it was not the brainchild of any one group. Therefore, excluding one group was in poor taste, whatever one’s position on abortion. I was also concerned that not enough women of color were involved. But a long time ago I gave up expecting well-meaning humans to be anything but messy, so if anybody gets it 80 percent right, I’m in. Joining over two million women in 600 cities across the globe was exhilarating. There was a gentle spirit in the crowd, and a collective wisdom. We were angry, to be sure, but I heard only a handful of curse words and very little hate-filled rhetoric. These were women doing what women do, working together to solve a problem. That was Saturday. Then Sunday came. I expected this kind of response to me personally when I transitioned. I was the first leader from my sizeable religious tribe to come out as transgender. There is always a special hatred reserved for those who are first. Just ask Hilary. I knew people would attack. The anger turned out to be far greater than I anticipated, but I figured, “I’m a big girl, I can handle it.” But I wasn’t prepared for the newly discovered power of social media, particularly Facebook. The hate that spewed forth from that medium was almost more than I could bear. Two weeks ago I spoke with Gene Robinson, the first openly gay man to be elected as a bishop in the Episcopal Church. We were both speakers at this year’s Gay Christian Network conference. After one session Gene talked with me about the cumulative effect of years of having been attacked. He said, “You stand firm on the outside, but inside it’s not so easy. It accumulates.” I took it as a gentle warning that maybe I don’t know half the price I am going to pay for having exploded the narrative in my little neck of the woods. Just yesterday I was talking with another well-known Christian leader who has received more than her share of hate mail. She said, “You stand strong in the day, but then you wake up in the middle of the night…” Her voice trailed off. She knows too. It takes a toll when people hate you. I make no apologies for being unhappy Donald Trump is president. He propagates falsehood and shows little regard for the powerless. His attitude toward women is deplorable and his excoriation of entire people groups is inexcusable. I protest his presidency on biblical grounds. The bible teaches us to love our enemies, welcome immigrants, and treat all humans with respect. By protesting Saturday, I believe I was following the example of Jesus. But unhappy as I am with our new president, that is not why I am writing this particular post. I am afraid the lack of civil discourse exhibited in the aftermath of the women’s march is one more tragic example of a parasite that could eat up our nation from the inside, destroying its soul in a way no external enemy could ever do. It does not matter whether the source of hateful rhetoric comes from the right or the left, it is just plain wrong. When Facebook becomes a tool utilized by the masses to attack any tribe but their own, we have a problem. When the attackers are evangelical women attacking other Christian women, we begin to understand just how deeply this behavior has become woven into the fabric of our nation. Unlike when I transitioned, the women who marched on Saturday did not know they had to build barricades to protect themselves from hurled insults. They did not know they needed to compile resources to prepare themselves for the verbal onslaught. If they had watched the Civil Rights movement they might have been better prepared, but for many who marched, there was not enough awareness of that pivotal time. Therefore, many of the women were sitting ducks, unprepared for the words so easily formed on the keys of a computer screen and delivered instantly, without benefit of edit, and without having to look anyone in the eye. Sticks and stones break bones. Words break beings. To my sisters, please be kind. I am afraid you are taking your cues from angry white men instead of listening to your own hearts. You took an effective tool of democratic societies for centuries, a peaceful protest, and turned it into an attack against you. I’ve only been a woman for a short period of time, but long enough to know that outside of an eighth grade classroom, this is not normal female behavior. These are powerful insights, Paula. I hope your message is widely read and discussed.